Now that the lazy days of summer are behind us and we’re back into school mode, the mad rush of mornings is upon us. If you’re anything like me, simply trying to drag my kids out of bed is difficult enough, without the added stress of preparing them something healthy before I rush them all out the door. Of course we all know that a wholesome breakfast is essential in preparing your children’s minds and bodies for a full day of learning. Here are five ideas for simple, tasty breakfasts that are simple to make and will give you the assurance that you’re sending your kids off ready to take on the day’s challenges. Fry two slices of bacon. In a bowl, mix eggs and milk with a dash of salt and pepper. Melt butter in a pot over medium low heat. Add eggs and cook, stirring often, until light and fluffy. Spread half of egg mixture down the center of each tortilla, add a slice of bacon and sprinkle with chopped tomatoes. Roll up your tortilla and you’ve got breakfast on the go. Add berries to a small bowl and top with yogurt. Spread with a little butter and top each half with one slice of Canadian bacon, one slice of tomato, one egg and half of the grated cheese. Place under a broiler until cheese starts to brown. Toast bagel and spread with cream cheese. Sprinkle with chopped pineapple and ham. Preheat oven to 350°. Spray a 9×5″ loaf pan with non-stick spray. Combine flour, sugar, baking powder, salt and baking soda in a large bowl. Add butter and mix until it resemble crumbs. Add bananas and eggs and stir until just mixed. Turn into loaf pan and bake for 55 minutes. Spread some nut butter on top to add protein to this filling breakfast. it looks like my moms banana bread too. I have to make it yum. 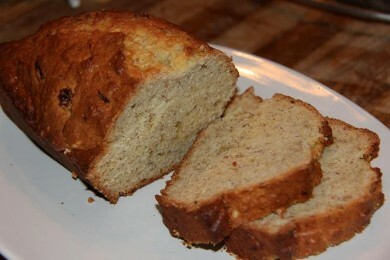 Walnuts or pecans are delicious in banana bread. And some Nutella would be yummy on top, too. Personally, I think a thick slice of banana bread, toasted and buttered, is about the best breakfast on the planet! Wow! Those breakfast burritos are wonderful. Easy, fast, filling, and delicious. I ran out of tomatoes once so I cooked up some diced onions in the same pan while cooking the bacon. Removed the bacon when cooked and left the onions in the pan while I cooked up the eggs. Really was a breakfast treat but could be used for brunch or lunch too. Yummm!